Much is being made of North Korea’s shelling of one of 30 disputed islands, Yeonpyeong, which houses a South Korean military base, on the border between the two Koreas resulting in the deaths of two South Korean marines and two civilians. The borders were unilaterally drawn by the UN at the end of the 1950-53 war and the countries are still officially in a state of war. Rumours are that the incident is connected to the possible transition of power from North Korean leader Kim Jong Il to his son Kim Jong Un, or to North Korea’s recent announcement that it is proceeding with its nuclear programme. The words of condemnation — of the north — from UN Secretary-General Ban Ki-moon and US President Barack Obama for the “provocation” flowed, as expected. Obama used the occasion to reaffirmed plans to stage joint military exercises later this week in the Yellow Sea, the latest in its own provocations of both North Korea and China this year, following the sinking of a South Korean warship in an earlier joint US-South Korean military “exercise”. Accusations that North Korea torpedoed the Cheonan, killing 46 sailors, were undermined by evidence pointing to the US itself. Pyongyang denied responsibility. The North’s only documented act of terrorism was the 1987 bombing of a South Korean airliner that claimed 115 lives. 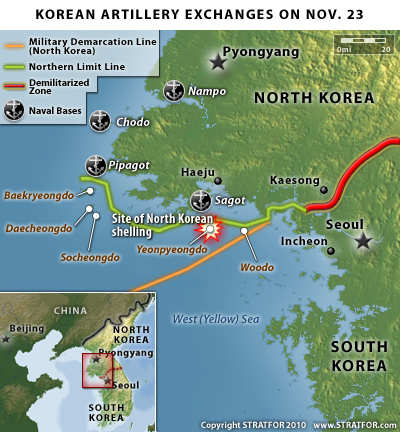 That the provocation is from the South Korea side, with its pro-US President Lee Myung-bak, who has made his anti-communist sentiments clear in the past is confirmed by the fact that the incident failed to scare off investors, with South Korea’s stock market experiencing only a momentary ripple.